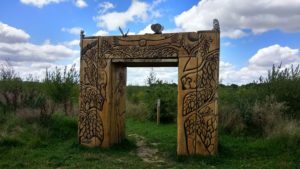 Heartwood Forest parkrun tourism- possibly the closest yet! I sort of have three home runs really, (St Albans where I started, Panshanger when that started, and then Ellenbrook since that got going), but any different venue counts for tourism for me. 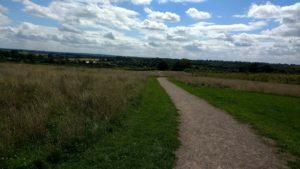 I am still trying to visit all of the Hertfordshire parkruns (I think there are now 13), and last weekend was the turn of Heartwood Forest. 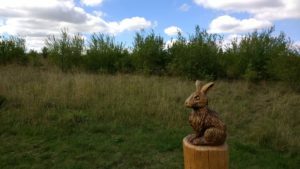 Heartwood Forest was recently created by the Woodland Trust on some land outside Sandridge, a small village on the outskirts of St Albans (which is why a lot of the trees are only a few feet high at the moment as they were only planted a few years ago). The parkrun has only been going a few weeks, and we chose that day as I was off to the athletics in the afternoon, and Dad and Tony had a football match to get to so we all needed to be finished fairly promptly. There is only a small car park on site, so they ask people to use other parking in the village, or better yet, to cycle or run there. 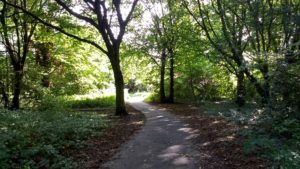 On Thursday I had been to my parents for lunch, so on my way home I parked in the village and headed along the bridle path to a walk around the woods, as I had not actually been there. It is lovely, with meadows and paths and amazing wood carvings. I pondered how to get there- I could park at my parents and then run there as it’s a couple of miles down a track, but my dad and brother would be cycling so I wouldn’t keep up with them and would take longer to get back. In the end I parked in the village about half a mile away and jogged to the start- I got there so early (as I was worried about it being busy) so I ended up running around the course a bit. We had the new runners briefing (loads of people- as it was only the third event so most people would be new to the course) and I chatted to a lady from Milton Keynes parkrun (it’s on my list) before I noticed Dad and Tony. 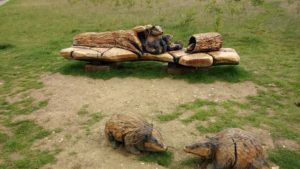 Then everyone walked up to the start, right by these amazing carvings of badgers. The course is nearly two laps- you start half way up a hill, run a lap (which is a funny shape and at one point is two-way so you have to keep right) finishing at the bottom of the hill, and then have to run up the entire hill on the second lap. Annoyingly because I had used my Garmin for the warm up, although I pressed to do a new run, when I thought I pressed go, I actually must have selected run, as it beeped to go into power saving mode around half a mile in, so my Strava is incomplete! I ran with Dad, and it was very enjoyable, although on the second time going up the hill I think I would have walked if we hadn’t been running together! I was aiming for under 30 minutes, and we started fairly near the back as we were not paying much attention on the walk to the start! 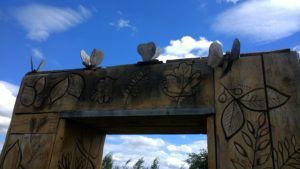 I loved this archway that you ran through- so many amazing carvings on it. You were rewarded by fabulous views once at the top. They also had really brilliant marshals. I know parkrun marshals are always great (especially any OH ladies at Ellenbrook Fields), but we had cheers from every one- one lady was playing music on her phone and dancing as we ran past, a few people had children with them and loads of instruments- they really were very encouraging- we commented that perhaps they had been borrowed from the Gamesmakers at the Olympics. A few also had cameras (including this one placed at the top of the hill- I promise we enjoyed it even though we don’t look like it!). After the hill there was a flat windy part through meadows and slightly taller trees, before heading to the long downhill to the finish area- it was the perfect downhill gradient as I didn’t feel like my legs were running away from me, or that I would trip as the surface was fairly smooth. When we reached the end of our second lap there was a sharp right-hand turn at the bottom of the hill before a final sprint to the end. My time was 29.03, for my 114th parkrun and my dad’s 99th! Badger Selfie of course- I took this before the start as I knew we had to head off quickly at the end. Then it was time for pancakes made by Mum before we all headed off to our respective afternoon sporting activities. 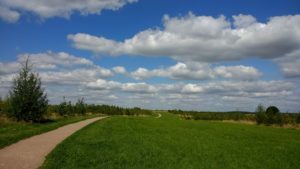 It’s great that there is another parkrun close by that we can all easily meet at, and it also means that if I fancy incorporating a parkrun into a longer run, I could adapt it and park at my parents before running there and back. I need to go back and get the Strava route correct! 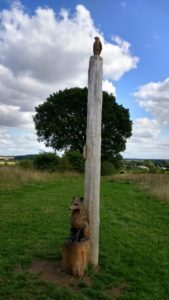 Done: St Albans, Panshanger, Ellenbrook Fields, South Oxhey, Aldenham, Stevenage, Rickmansworth, Barclay, Tring, Gadebridge and Heartwood Forest. I will miss the next two weekends, and then it is Dad’s 100th so we will be at a home run for that, so touristing will have to take a break until mid-September. 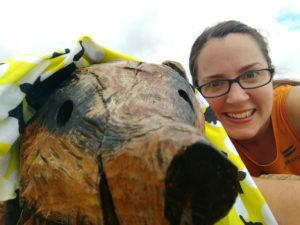 How do you usually travel to parkrun? If you have several near to you, how do you choose which one to visit each week? 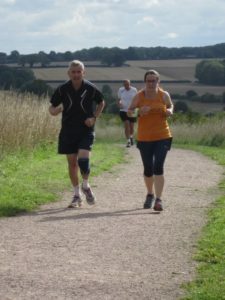 Are you aiming for anything particular at parkrun at the moment? Once I have done the Hertfordshire parkruns, I might look at the alphabet challenge but that seems to make touristing a lot more complicated! I’d also love to add a few more countries to my list, but that will be a more long term goal. 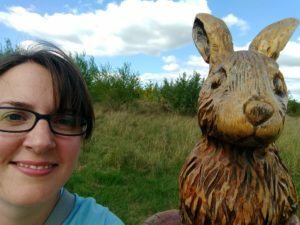 Author Maria RunsPosted on August 15, 2017 Categories Running, Stuff I love! I normally drive to Netley parkrun, my home one, because I help set up (tho I haven’t done that in ages!). When I move back to my parent’s the Lee parkrun will be a lot closer and easier to run to so I wonder if I’ll start doing that one more… it’s always nice to have a warm up before parkrun as well. Plus winter parkrun when you’re setting up is really miserable and I’d like to give it a miss a lot more this year as it makes me grumpy hehe. Well done on your sub-30! And your dad is so close to 100th! I still have quite a few locally I haven’t done (including the one located where I work!). Need to get on my. It’s nice that you have a lot of options around you. Previous Previous post: The week where I remembered just how much I dislike steaming wallpaper!